Welcome spring is here. With the snow and ice going away, we will have longer warmer days ahead. BBQ's in the back yard, hiking, fishing camping, and all the things we enjoy living here in Houston. With the snow and ice gone, we need to be good stewards of our communities and help with clean up week. So let's take a few minutes out of our relaxing spring day, grab the kids, pick up around the yard, a few extra feet on the road. Make Houston a little cleaner and a better place to live. 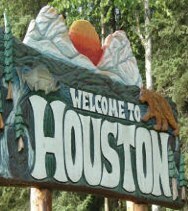 This one small step goes a long way in making Houston "Where the real Alaska begins". During the City council meeting last night, Deputy Mayor Frost read an article from the Anchorage Daily News that Officer John Rhyshek, while on duty, had saved the lives of two boys who had turned over their canoe in Meadow Lakes. Officer Rhyshek went above and beyond the call of duty, and should be given a commendation by the city for life saving on this heroic action. Kudos Officer Rhyshek for a job well done.